Our state capitol is bursting with wonderful architectural nuance, and some of it is not readily apparent as one wanders the halls or the grounds. In fact, I discovered the pediment statuary above the House chamber windows, on the building’s west side, completely by accident. I was standing out there in a crowd of people, waiting for a fancy jet fly-by that was due to happen, and it just caught my eye. It’s fascinating to me how much detail is there, despite the sculptor’s understanding that very few people would ever have a clear view of it. Squinting to see the shapes and forms, I wondered what they represented. 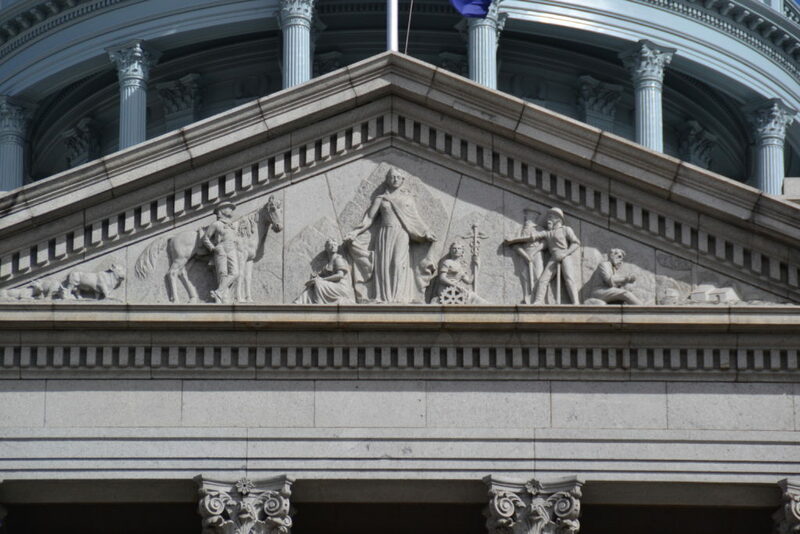 Dr. Derek Everett, former capitol tour guide and author of “The Colorado State Capitol: History, Politics, Preservation,” provided the following information via email about the pediment and the accompanying photo. What’s your favorite thing about the capitol building? Let us know on Twitter @LegiSource.